Wake at five thirty but wait until six to ring home (three hours ahead.) 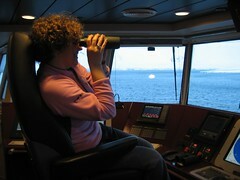 So good to chat with Nev and then Sarah, on a line with no delay, as a Giant Petrel flies past the porthole. Minutes fly by, must be at breakfast for seven. Sit with the expedition staff. Waiters are happy to see us (but sad that my hair is cut short.) Whiz over to Goudier Island ahead of eight-thirty landing. Despite this being our largest visit in terms of numbers (230) the passengers are well managed and flow is steady. Famished after, so finish left over curry. Bread and Jam for pudding – with the special Calafate berry jar so kindly given by Marco. Rick has found an e-message sent from Endeavour yesterday, asking if they can come in this afternoon (instead of 28th)- try to reply. Neaten piles of t-shirts (Now I can empathise with those Benetton shop assistants) and restock as far as necessary. We have loads of post to process from Nordnorge, so congregate in the bunkroom to apply stamps, make up new mint sets and frank (spread out on kitchen table to dry quickly.) Endeavour running late. Go on a mini monitoring expedition – lots of muddy eggs in puddles. Chick numbers will surely be low this year. 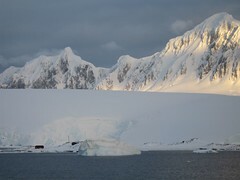 At seven pm Endeavour hangs left into Port Lockroy and sends a zodiac to collect us for dinner (me and Helen enthusiastically run down to the landing site in our immersion suits.) Richard the bird man, is driving, and fills us in on the scene he saw around the Explorer. There are growlers around the gang plank, so we wait for them to pass. Delighted to see Tim and a wee welcoming committee for big hugs. Straight to the dining room where we receive a rousing clap from a bunch of eager bunnies. Delectable dinner, gourmet fish and chips, hot chocolate fondant swilled down with a couple of glasses of wine. I cause delay to first zodiac by running round finding a WC, and then we drop a couple of staff off at Jougla Point… so we arrive at the landing after the first passengers. Run up to the hut, comedic removal of immersion suits, package up mail, pull on long johns, light tilley lamp and the shop’s in full swing, credit cards all the way. Great spirits and much patience. Sad to forego party on board, but KK is expected at 9am, we have lots of Endeavour mail to cancel and shop to restock. I stamp the stamps, Helen counts cash, Rick makes camomile tea and cocoa. Finish at eleven thirty. Wind blowing fine smoke. Bremen (who have come by for the party) and Endeavour are ablaze, zodiacs buzzing between the two. Traffic noise for the first time in weeks! A proper sleep in! Awake at eight thirty. Happy to have loving replies in my e-mail inbox. Mooch around after half an hour’s yoga and swiss ball in museum lounge – a challenge with socks on, and too cold to relax, but worth it nonetheless. Turn on computer for the first time since we arrived; the screen stays dark… wait for it to adjust to ambient temperature… still nothing… try not to panic, nor consider the disastrous implications of no personal computer for the season; no music, no photos, e-mail addresses… Tudor suggests that battery is flat and can be recharged when the generator is next on. Hmmm. Anyway, food shelf sorting/cleaning needs finishing. Discover all sorts in dark and dusty recesses – so much chilli powder, so many frozen tins of baked beans… A cushy job compared to the others, who are prepping museum kitchen and science room for decorating; there will be no opportunity once the ships come sailing in. My but it’s cold! More snow shovelling to warm up, and Helen conducts first lesson in tap dancing; very effective for increasing circulation in toes. We’ve been fantasising about spam fritters (well, a Sunday fry up…) Tudor knocks them up in a jiffy, plus a side order of baked beans, mmmm. Red overalls on to sand and undercoat wooden partition wall, lots of obsolete electric cables to manoeuvre round, funked up by Jamiroquai. Helen’s getting sore arms tackling kitchen ceiling. Tudor is rationalising the massive wooden crate of medical supplies; unpronounceable names of drugs we’ll hopefully never ever have cause to need. Being official Penguin Monitor I am reading through wildlife reports. 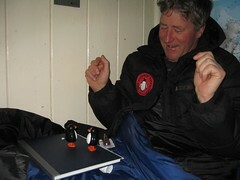 They were started ten years ago by BAS biologist Norman Cobley, as Port Lockroy provides a unique opportunity to assess human impact on the island gentoo colony over each Austral summer season. I am a little daunted by the obvious experience and expertise illustrated over the years but attracted to the systematic nature of survey. My eyes will tune into the observation… not sure about working out percentage successes though. Fabulous Helen TVP lasagne followed by compo ration sachet of “Custard with mixed fruit.” Remarkably good. Most of the food we’re eating has the texture of semolina – yes everything – especially thrice frozen tins… learning to love oh yeah learning to love… Gentle music, reading, postcard writing. Every time the kettle has boiled more ice chunks are slid in to melt. Relaxed and warm inside (91% humidity down from 98%) bright and the wind picking up outside. We all thought it was going to be a cold one, the wind blew up, but it wasn’t too chilly really. Wake with the expectation of leaping into action, but there’s no ship on the horizon. It’s about three degrees (plus wind chill). Back into bags with tea and muesli. Rick reads, Helen knits, Tudor thinks. I write: I’m scared. Last night I was kind of close to tears – scared that this is hard and we’ve only just begun. E-mail from ship – eta three pm. Relaxed pottering = much happier. We have the luxury of not rushing, finishing off labels, tweaking. Tudor is brilliant at ‘Display’ – his family used to run a department store. Prepare for the rush by tearing sheets of stamps, and wrapping First Day Covers in protective wrappers. Rick and Tudor are fixing up the Penguin Study Area’s ropes and posts (so that human impact can be monitored with control colonies. Shovel snow from front decking in order to increase circulation and warm up, which takes minutes! First on-site lesson in radio use for Fanny and Pickle (for that, inexplicably, is what this season’s postal staff have been named,) involving wandering about going “Wot? eh? What button? Can’t hear you! Over and out!” etc. Funny. We’re sure to get the hang of it soon enough. Helen counts out float, and places stamps, paper bags, credit card machine etc on the counter. I prepare an emergency snack box for under-counter guzzling and bottles of quenching water. We’re ready to be there for maybe five hours without pause. We’re waiting…and waiting… and waiting… getting hetty- keep going to the door and peering out. Finally take tea on the veranda. 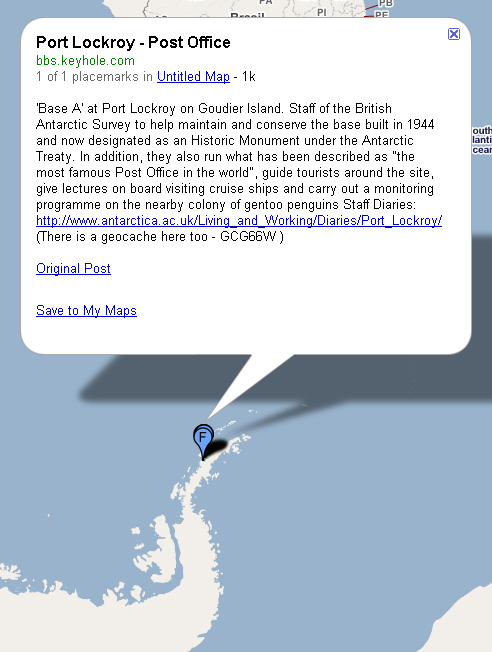 Rick checks e-mail; ship is not coming – impossible to negotiate ice in the Gerlache Strait. Oh. So we can finish glossing the walls… Ah ha! We can also start our Post Mistress duties: Mail that was posted here at the end of last season, after the PO ‘closed’ in March, together with all the new postcards from the Nordnorge, need cancelling without delay! Hurray! Much excitement and anticipation. First we apply hundreds of stamps to prepaid mail (i.e. a bundle of postcards with enough dollar to cover postage.) Helen ensures date correct on the rubber stamp. Cameras at the ready and we’re off, stamping away and laying out the cards so the ink will dry in this temperature, and not smudge. Every so often, consulting PO instruction manual for guidance re. Non British Antarctic Territory stamps, special issues, Philatelic collectors items, not to mention how each stamp must be ‘tied’ to the envelope by the cancel. I LOVE it! 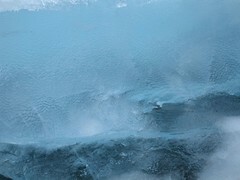 Setting up a system, music on, singing away to hits from the 80s…peeking out of the window to see penguins, glacier edge and sheathbills running round in circles. Bliss. Nearly done by six thirty, and no more room to lay them out. 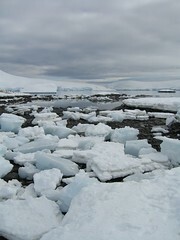 No ship means no fresh water, so down to the rocks at low tide, to chip ice from a berg that doesn’t taste too salty. 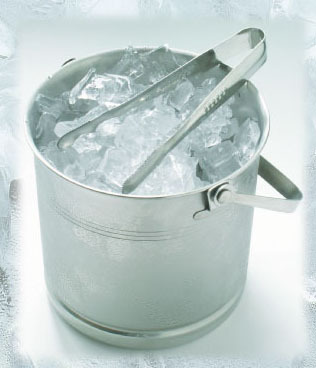 Five washing up bowls full later, clamber back with the ice picks. Minus one degree outside… no chance of it melting; the bowls will cool down the bunkroom tonight. 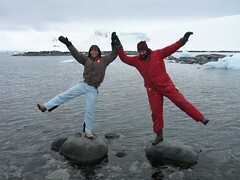 Squat on rock by water’s edge for first Antarctic alfresco pee, staring at limpets in the pools thinking ‘Bloody hell! 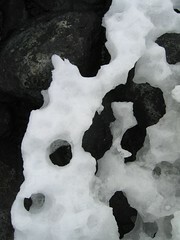 Here I am!” Shiny icicles on the overhang contrast against diorite rock. Big Saturday Treat: It’s Fray Bentos Night! Rick’s favourite; with peas and potatoes, followed by rice pudding and raspberry jam oh yeah – the best feast, despite multiple freezings. Stuffed, hot and fumey (from heater and Tilley lamp,) nice n’ fuggy. Accompany Rick up to the loo. Gingerly climb down snow steps, balance on rock, chuck waste into high tide, wobble down to lower rock to swill out, slip, squeal and return up steps to where Rick stands smiling, saying nothing. Stop to admire lines of mountain ridge against bruised mauve sky. Sing to the gentoos as if this island is a cathedral. Toasty toes, still chilly nose. Slept well, up with the joys at six thirty. Peek out the door on the way back from bucket to see thin pancake ice, and the penguins so still, gathered on Bill’s Island, that they look frozen. Kettle on and back in the bag. Today’s mission is to sort out the PO/shop room (The new Generator Shed) before stock goes in. Everybody else has unpacked into their underbunk storage boxes – I’ve been putting it off (fears of too much stuff) – seize the day and attempt to make contents of pink Harris tweed holdall, blue canvas bag and two boxes of personal stuff make sense and fit. Meanwhile Helen tackles the First Aid/Cleaning cupboard, which contains an abundance of ancient Lemsips, numerous toothpaste tubes, rolls of cling-film and cigarette lighters. 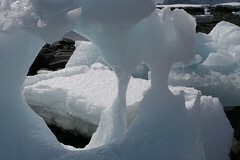 Decamp the four hundred sets of ‘Iceberg Library’ postcards to shop – delighted that they’ve made the journey here too. 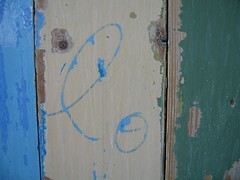 The decision has been made to paint the shop. The day is so blue and still and wondrous outside that we are easily distracted. Move boxes to far end, lay down opened out flattened cardboard in lieu of dust-sheets. Helen is assembling optimum nut snack and muesli supplies down at the boat shed, misses initial horrid sanding (makes up for it later) before transforming last night’s curry into soup of the day. Instantly dusty hair ooh but I’m loving these overalls – family would be amused to see me now I think. As we’re running short of water (we had seven jerry cans full from the Nordnorge) Helen and Tudor go down to the blocks of ice on the low-tide shore and chip chunks off with pick-axes, to melt in the boat shed (always warm and wood-smelling.) A battle-scarred young male elephant seal wearily tries to haul out onto our icy shore, evidently needing to lie low – he sleeps all afternoon, ignoring the penguins and us. Stand still in the beauty, I’m so happy to be here. Right: Painting. Stir around five am. Over the next few months I’ll try to describe Rick’s snore, but today there’s more important stuff to depict. Snug as bugs in our caterpillar cocoons, condensation running down the walls. Rick puts the kettle on. Bladder has been bursting for the last hour at least, but since my nose, the only part of body out of sleeping bag is cold, trip down Baltic corridor, through Genny Shed, to the bucket, is not appealing, but finally essential. Ah but tea’s ready and Rick’s making porridge. It’s the Scottish salty kind – but good n’ warming, and especially good with shavings of frozen honey and dried apricots – yum. Eight o’clock aah the first tender boat full of visitors from the Nordnorge is on its way. Run around moving boxes from the lounge, uncovering protective plastic from the science room and transferring artefacts from safe back to their places on the museum shelves. (Marco the German Expedition Assistant has successfully managed to twiddle knobs in correct sequence – Hurray!) Wonderful to see familiar passengers; their responses are a mixture of aghast and admiring. Prop myself at Bar in lounge and merrily explain how there’s no electricity or heating here. People I’ve never spoken to wish us luck and a happy season. One man even returns to the ship, insists the boutique is opened, and sends back a large bottle of Jagermeister – our first gift, for medicinal purposes, obviously. And Mairi bestows her sheepskin hat and two apples. 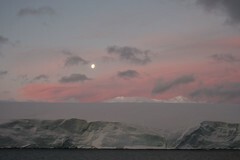 Once we’ve said goodbye to Nordnorge, unloaded remaining supplies and watched her slip behind the ice walls of Neumayer Channel, we sit out on old church hall chairs in the snow for a cup of tea. The task ahead of us: to stack and store this box mountain – finding a home for 600 boxes. Tudor has a plan. It takes hours and hours, in between pauses for cups of tea, with macaroons (half-inched from ship when T went to check the hold) smeared with dolce de leche. Basking in the wonderment of working up a sweat next to the swimming penguins in an iceberg water garden. Lunch is oatcakes and corned beef (dog) – which never tasted so good. By six thirty every single box has found a home (albeit temporary) and the tarpaulin is bare; fold it up, liberating that patch of snow back to the gentoos, who mull about, and swiftly settle back. It’s beer o’clock! But I’m behind with this, and reluctant to shut the door on the day, so I stand on the threshold writing until fingers too cold to hold pen. Curry for dinner, cooked by Rick. All food here tastes like Nectar of the Gods, perhaps because it’s been a long while since such physical labour. This meal, being hot, thaws us out from the inside. Dreamily cosy in our bunkroom (kitchen, bedroom, living room combined, in 5 x 6 metres) now that the propane heater is on. Helen knits, Tudor washes up and I’ve been nominated to start the base journal, we’ll take it in turns day by day. Not sure when I’ll have time or battery power to write this, so apologies for delay. All rosy-cheeked and curried up, cosy in and Rick starts to snore. *A very Happy Birthday to Charlotte and Rhys!! 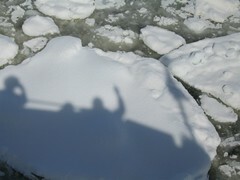 Rachel Hazell will set sail in under two months time to the beautiful world of ice-white Antarctica. Rachel’s new job will be Post Assistant and Penguin Monitor where she will stamp over 20,000 postcards in the time she will be there. 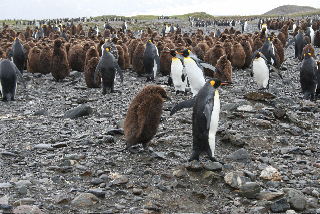 In between handling all that card and ink, Rachel will step outside and very quietly and gently tip toe around the sleeping penguins, counting them and their eggs and recording the data for the international penguin monitoring programme. 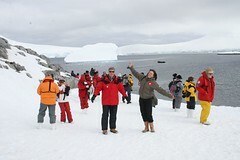 Rachel said, “I am thrilled to be finally living my dream as Post Mistress for Antarctica. I’ve lived on one of Her Majesty’s Navy ships, teaching sailors to make small books, but this has to be my biggest life long ambition.” This will be the site for Rachel’s diary while she is away, so come back often for updates from abroad.